The Doors were an American rock band formed in 1965 in Los Angeles, California, with vocalist Jim Morrison, keyboardist Ray Manzarek, drummer John Densmore and guitarist Robby Krieger. 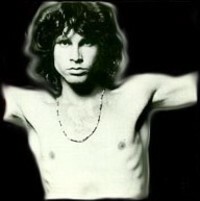 They were among the most controversial, influential and unique rock acts of the 1960s and beyond, mostly because of Morrison's wild, poetic lyrics and charismatic but unpredictable stage persona. After Morrison's death in 1971, the remaining members continued as a trio until finally disbanding in 1973. Three of the band's studio albums, The Doors (1967), L.A. Woman (1971), and Strange Days (1967), were featured in the Rolling Stone list of The 500 Greatest Albums of All Time, at positions 42, 362 and 407 respectively.The band, their work, and Morrison's celebrity continue to be considered inexorably embedded within the larger counterculture of the 1960s. In 1993, the Doors were inducted into the Rock and Roll Hall of Fame. 2003 German repressed on 180gram LP= The last album to feature Jim Morrison before his untimely departure that same year, includes the alltime classic "Riders On The Storm". presented in original artwork picture sleeve. 2010 Rhino repressing on 180gram LP- with touchstone hits "Love Me Two Times" and "People Are Strange" as well as the fan favorites "Moonlight Drive," "Strange Days" and "When The Music's Over."